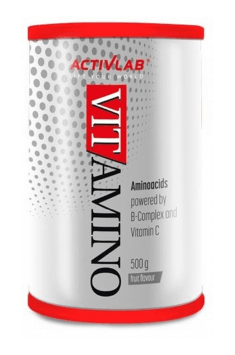 Activlab VitAmino is a dietary supplement in the powder form, for making a fruit-flavoured drink. It contains essential exogenous amino acids (EAA), and the water-soluble vitamins: vitamin C and the complex of vitamins from group B. This product protects muscles against catabolism, improves energy production and helps to supplement the vitamin deficiencies that result from the intense physical activity. It also increases the body’s efficiency, promotes the anabolic environment maintenance, and shortens the post-workout regeneration time. Exogenous amino acids are not synthesized in the body, so it is necessary to provide them in the right amount, as they are necessary for the muscle fibres regeneration and anabolic processes. To provide the right protection against muscle catabolism that occurs during the prolonged effort, this product contains all 10 amino acids from the EAA group. Glutamine. It constitutes approximately 60% of the proteins found in muscles, and is one of the most abundant amino acids in the human body. Glutamine is responsible for nitrogen storage and transport in the body, inhibits the processes of muscle tissue breakdown, supports wound healing and accelerates the tissues regeneration. Arginine. It is considered to be a relatively essential amino acid as it participates in the nitric oxide (NO) production. NO is responsible for the capillary walls loosening and improving the blood flow. Arginine increases physical performance, stimulates the immune system and participates in the urea cycle, playing crucial role in the excretion of toxic ammonia. Lysine. It is essential for the collagen synthesis and the correct structure of tissues, cartilage, ligaments and blood vessels. It participates in the production of highly anabolic growth hormone (HG), improves mood and protects the body against herpes viruses. Phenylalanine. Majority of body proteins consist of phenylalanine. It can be used as a substrate for the synthesis of important neurotransmitters (serotonin and dopamine) that are responsible for good mood, motivation and memory. It also participates in the synthesis of the thyroid hormones: triiodothyronine (T3) and thyroxine (t4), that regulate the body's energy balance. Methionine. It participates in the production necessary compounds in the body, including proteins, glutathione, phospholipids, collagen and creatine. This amino acid supports the detoxification process and is necessary for the proper course of methylation. In addition, it may increase the bone mineral density and regulate the neurotransmitters level. Threonine. It participates in the synthesis of new muscle proteins and collagen, supports the fatty acids metabolism and the absorption of nutrients from food. In addition, threonine strengthens the immune system and optimizes the work of the nervous system. Tryptophan. Is essential for the synthesis of serotonin, a neurotransmitter responsible for a good mood and well-being. This amino acid intensifies the beta-endorphin production, reduces anxiety and appetite, and participates in the production of niacin (vitamin B3). BCAA are branched-chain amino acids that include L-leucine, L-isoleucine and L-valine. L-leucine has the strongest effect on mTOR kinase activity, that promotes the synthesis of new muscle proteins and contributes to the development of muscles in strength training. Its isomer, L-isoleucine, together with L-valine, increase muscle glucose uptake, inhibit the proteolytic enzymes activity in the muscles, intensify the muscle glycogen resynthesis, reduce muscle damage and pain, and delay the fatigue. Vitamin C. It is a powerful antioxidant that supports the fight against free oxygen radicals formed during the intense training. It participates in the collagen synthesis, supports the bones construction, and the circulatory and immune system. Thiamine (vitamin B1). It participates in the nutrients metabolism, and ATP and neurotransmitters production. It is necessary for the impulses conduction in the nervous system. What is important, the demand for thiamine increases with the calories intake. Riboflavin (vitamin B2). It participates in numerous energy processes and ensures red blood platelets stability. In addition, it can reduce the risk of cataracts and increase the bioavailability of other B vitamins. Niacin (vitamin B3). It is necessary for the nicotinamide adenine dinucleotide (NADH) production. It is an acceptor of electrons and protons and participates in energy production and cellular respiration. Niacin also protects DNA against damage, the skin from excessive UV radiation, and its deficiency can cause skin problems. Pantothenic acid (vitamin B5). It determines the nervous system functioning, and when combined with sulphur it creates Coenzyme A (CoA), which participates in many processes like: obtaining energy from carbohydrates, proteins and fats, neurotransmitters and ATP forming, and resynthesizing glycogen. Vitamin B6. It enables the muscle glycogen use, and the gluconeogenesis process. It is also needed for the neurotransmitters, hormones and muscle proteins synthesis, and it reduces the inflammation markers in the body. Biotin (vitamin B7). It is a cofactor for many enzymes, it supports the energy production and is involved in the glucose and fatty acids metabolism. It is also responsible for the myelin sheaths production that protect the nerves from damage. Biotin improves the skin, hair and nails condition. Folic acid (vitamin B9). It is involved in the body’s cells reproduction and in the DNA and RNA synthesis. It is also essential for the red blood cells development, the course of methylation, and is needed to maintain the brain health. Vitamin B12. It participates in the red blood cells production and improves the efficiency of the oxygen transport in the body. B12 supports the neurons regeneration, prevents the neurological diseases development and supports the skeletal system construction. Summing up, Activlab VitAmino combines the benefits of essential amino acids, B vitamins and vitamin C. This product supports the body functioning during physical activity, improves the energy production, limits the catabolic processes and reduces the feeling of fatigue. Dissolve 1 measure of powder (10 g) in 330 ml of water. Take before, during or after workout. B vitamins participate in many enzymatic reactions responsible for the energy production in the body. Their supplementation is recommended especially to people who are involved in high physical activity level. B vitamins and the amino acids that are present in this supplement make it an ideal product for those, who perform long-lasting and intense workouts, and who want to support the energy changes in the body. This supplement may cause a bright yellow colour of urine. It is a natural reaction of the body to the riboflavin (B2) excess that is removed with the urine. Acidity regulators (citric acid, sodium citrate), inuline, colourant (beta-carotene), aromas, soya lecithin, sweeteners (sucralose, acesulfame K), thickener (carboxy methyl cellulose), anti-caking agent (silicon dioxide). May contain derivatives of: cereals containing gluten, milk.